What Do You Do During Your Rituals? As I promised in my last post, today I'm going to share a bit about what I actually do during my twice monthly lunar rituals. A lot of it will feel very familiar to people of a Pagan or Wiccan persuasion since my practice borrows very heavily from traditions under the (neo-)Pagan umbrella. As I've mentioned in many prior posts, I'm very chaotic, and I'm not sure that I've ever done anything exactly the same way more than once. It might help to think of this write-up as someone attempting to transcribe an improv performance. I'm likely to do most if not all of these things, but there are a ton of variations based on how I'm feeling in the moment. Timing, however, has been a constant for me from day one. I get up much earlier than most people. It's not unusual for me to be up by 4:30, and I'm usually the only human awake in my house for at least an hour. My schedule provides me with a healthy dose of alone time to start out my day, and my religious practice fits nicely with that block of time. I almost always start setting up for my rituals as soon as I get out of bed. As you might gather from that, I practice my rituals in a solitary manner. It's possible that I may feel an impulse to work with others in the future, but given the intensity of my introversion, I'm not sure that it's likely. 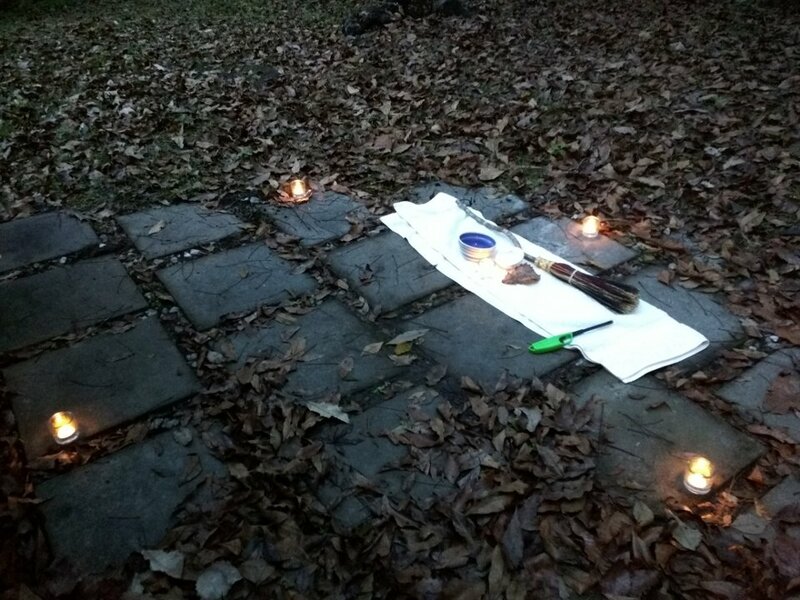 In terms of location, at first I held my rituals on my enclosed back porch, but since I planted the Witch's Garden in the backyard, I much prefer setting up outside beside the garden. All through the process, I hear the running water in my creek and the wind blowing through the trees, which really helps connect me to nature. Fair warning: If you're not of a Pagan/Wiccan bent, a lot of my ritual practices may seem silly to you. Honestly, I wrote pretty extensively in my journal when I first started these rituals about how things felt very natural in the moment and then silly when I went back to write about my experiences. To borrow an explanation from the Reclaiming tradition, ritual is meant to speak to your inner kid, your Younger Self, your unconscious mind. Ultimately, there's nothing wrong with silliness if it helps inspire positive change in your life. When I first started out, I intentionally didn't have a lot of these items. I've incorporated items over time as I've felt a need for them. When I feel like something is missing, I make a note of it and fill that gap before the next ritual. Left to my own devices, I have a real tendency to get excited about things and then buy a lot unnecessary stuff, and I didn't want to my religious practice to be something I associated with consumerism. This is my way of safeguarding against that. I don't have an altar for my rituals. I usually just set up on the patio stones between my back door and my garden. When I'm ready to start the ritual, I take hold of my broom by the handle, hold it to my chest, and ground/center myself. At first, I did this by visualizing roots extending from my feet down into the earth, branches growing up from my head toward the moon, and imagining the feeling of drawing energy from both above and below. These days, I usually don't even have to visualize. I just breathe deeply for a few seconds and reconnect with the feelings I had during my initial visualization sessions. Sometimes it also helps to make a hand gesture with my left hand like I'm pulling something out of the earth and sky toward my chest. Also, in this step and in the steps that follow, if I feel like I'm having trouble focusing, I will verbally describe what I'm trying to as if I'm narrating (e.g. "I'm drawing energy up from the Earth. I am part of the Earth, and I feel that connection now."). I find that this focuses me even when I'm feeling very scatterbrained. What does it feel like to be grounded and/or centered? At first, I had no idea, and I just felt like I was going through the motions. However, when I moved my rituals outside, I experienced a tingling or cool sensation that ran along my spine and settled in different parts of my body: my head, my chest, my gut, or my womb. This sensation is something that I had previously experienced during private prayer and contemplation when I was much younger but hadn't felt in nearly twenty-five years, so I was surprised and pleased that it came back to me in the context of my private religious practice. For me, this is the feeling of connecting to something much larger than myself. It's the feeling of finding a reserve of energy that you previously didn't know that you had access to. Ultimately, I'm not sure how feeling grounded or centered would feel for you, but I thought it worthwhile to attempt a description of my own experience since I found that to be a gap in a lot of meditation tutorials and pagan books. Once I feel grounded and centered, I take up my broom and make sweeping motions, visualizing that I am removing negative feelings with each pass. I don't actually let the bristles touch the ground, but the motions are otherwise exactly like I'm sweeping out the area. I usually say something along the lines of, "By my will and with the power of nature itself, this space is made sacred." When I do this, I am using the motion of my body to reinforce the idea of leaving behind any stress, anger, fear, or any other "negative" feeling. For me, this is an important part of creating a sacred space. I am very passionate. I feel and express things with an exclamation mark. To connect with wisdom or the divine, I need to leave behind concerns that anchor me to the world of everyday minutia and frustration. I feel like it's important to note that emotions are not a bad thing in my practice. Emotions are human and a big part of what connects us to the universe as a whole. I just find that I am more likely to feel interconnectedness with other living things when I'm focused on laughter, happiness, love, etc. Next, I cast the circle using my broom as a wand of sorts (handle-out, bristles toward my body). This part tends to change the most from ritual to ritual. Sometimes, I walk the circle clockwise, starting in the north and visualizing a circle of protective energy. Sometimes I stay in the center of the circle, pointing my broom in each of the cardinal directions and drawing an invoking pentagram in the air in each direction. Sometimes I just visualize the circle being filled with moonlight that radiates out from me. The important part is that I'm designating this place as sacred. I'm mentally outlining the boundaries of a temporary temple for my religious ceremony, giving my ritual a feeling of gravitas. I call out to the guardians of the east, spirits of air and intellect. I invite you into my circle to participate in my ritual in honor of the moon. I call out to the guardians of the south, spirits of fire and passion. I invite you into my circle to participate in my ritual in honor of the moon. I call out to the guardians of the west, spirits of water and adaptability. I invite you into my circle to participate in my ritual in honor of the moon. I call out to the guardians of the north, spirits of earth and stability. I invite you into my circle to participate in my ritual in honor of the moon. And with me I bring spirit, the moonlight in my soul. I am a light in the darkness. I leave moonlight in my footsteps. I don't currently wear my pentacle necklace because I feel like I haven't "earned" it yet. I rather like the "year and a day" concept found in a lot of Pagan traditions wherein you have to study for a year and a day before you can formally join a circle or coven. In my own practice, I regard this phase of my life as an ongoing learning or initiation process. When it feels right, I intend to publicly take on an appropriate religious label and (if it still feels appropriate) begin wearing my necklace publicly. As I've mentioned in previous posts, I have a confusing relationship with the concept of deities. Rather than invoking deities like many pagans do, instead I usually invite "the spirits of this place that I call my home", "any spirits or powers that come with good intentions", or even "Nature and her representatives". Because I have always been very into Greek mythology, I also sometimes invite the participation of Artemis, Hecate, and Athena with mini-invocations or improvised poetry, but I'm not sure that I believe in goddesses, gods, or supernatural entities. I'm still figuring out a lot of this, but it feels safe to say that goddesses and gods are not a major focus in my religious practice. At this point, my ritual differs depending on which phase of the moon I'm currently celebrating. If it's the new moon, I focus on sending energy and well wishes toward the moon. I take a few moments think about how we all have a responsibility to help those who are going through hard times. I also verbally outline my goals for the upcoming month. That sounds a lot dryer than it turns out to be. In practice this is more like a spoken word performance about my intentions, goals, and desires. It's a promise to myself, witnessed by Nature herself. Depending on the events of my life, sometimes it's more like an outpouring of sadness, anger, or loss. No matter what, it's a moment where I remind myself that I have the power to influence my own life, and I vow to take that responsibility seriously. At the full moon, I focus on taking in energy from the moon. I take a few moments to think about how all of us sometimes have to rely on the help of others to accomplish truly big goals and how none of us truly stands alone. I review my goals and intentions for the month, and I ask myself how I'm doing. I start thinking about how I can finalize what I'm trying to accomplish. I force myself to think a bit more practically about actually finishing what I've started, something that I sometimes struggle with. As with the new moon ritual, this is often intense spoken word poetry more than mundane project management, but the goal is the same. At this point, I thank any spirits, deities, or forces of nature who assisted with my ritual and usually say something along the lines of "The ritual is complete. Stay if you can, but go if you must." Then I banish the circle by doing something that's basically the reverse of how I cast the circle: I walk anti-clockwise around the circle, visualize taking the energy back into myself and returning it to the earth/moon, use my broom to draw a banishing pentagram in reverse order, or whatever seems most appropriate. Once the circle is finished, I usually take my offering out into the wooded area by my creek and leave it there in appreciation. A lot of times, I'll hear something scamper over and take the food before I even make it back to the house. I take my stuff back inside and put everything back on my altar. Finally, I make it a point to eat and drink something as a way of reconnecting myself with my body and the everyday world around me. So why post all this? For other folks who feel inspired by Pagan rituals and practices, I hope they'll just steal or adapt anything that feels useful. As an application developer, I'm a huge fan of people sharing solutions to problems for others to use. For me, those same ideals extend into my spiritual life. When a faith tradition is secretive (which is literally what the word "occult" means in a historical context), it's really easy to either minimize or demonize it. Even if it's not fair, humans have a real tendency to assume that things that are hidden or secret for sinister or nefarious reasons. In reality, it's often just a very private part of someone's life. A lot of us feel very vulnerable when we talk about our religious practices because it's a part of our lives where we're not always motivated by logic and reason. It doesn't feel great to get drawn into a debate where you have to justify religious or spiritual practices that are motivated by sincere and very personal beliefs. I guess I'm hoping that maybe the next time you meet a witch who tells you that she attended a Samhain ritual over the weekend you won't fill in the blanks with terrible stuff you heard about on daytime talk shows from the 80s. Or maybe when your friend starts wearing a hijab, you won't feel compelled to make her explain why a feminist wants to cover her hair. Or maybe the next time someone makes a joking reference to a South Park episode making fun of Mormons or Scientologists, you might feel brave enough to say something. I'm not asking you to believe in any particular thing, and I'm always in favor of speaking out when someone is using their beliefs to justify a secular institution being able to discriminate. I just ask that you keep in mind that people participate in rituals and practices that may seem weird to you for a variety of reasons. If you keep an open mind, you might find that your Christian co-worker is as excited about evolutionary science as you are, and your atheist relative might be really interested in Greek mythology and recent efforts at polytheistic reconstructionism.